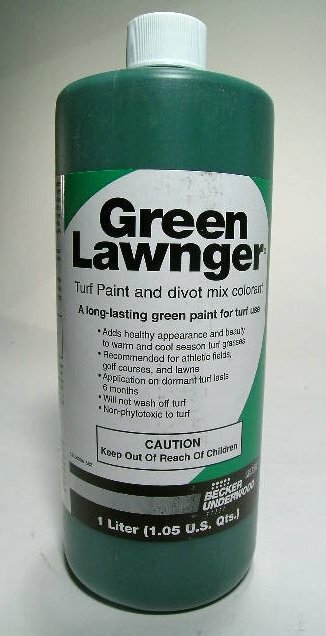 PRODUCT DESCRIPTION: Essentially a harmless dye which is used on grass and plants mostly for cosmetic reasons. Once mixed with water, you then apply it to damaged grass. The application can effectively mask and hide damage due to fungus, insects, animals and drought. 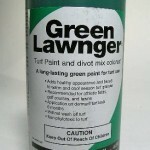 Though commonly used on golf courses and other landscaped public venues, Lawn Green can be applied to any yard safely. It poses no hazard to people and pets and will wash away over a period of 4-8 weeks, generally the time it will take for new plant growth to replace that which was damaged. Applications also serve to alert you to any new damage which is happening. Once you cover up all the damage with one treatment, you can then tell where new fungus or other damage is surfacing by easily spotting new brown patches. WHERE TO USE IT: On any type of grass or turf. RATE OF APPLICATION: This will vary. It is recommended that you start with 4 ounces of Lawn Green to a gallon of water and see if that creates a color dark enough. If not, keep adding one ounce till you get as close a match as possible. Generally a mix of 4-8 ounces is all that is needed per gallon if you are spraying grass which is already mostly green. When treating turf which is dormant or brown, it could take as much as 15 oz per gallon of water. Coverage should be in the 500 square foot range per gallon of finished product. That means you should get 5,000 to 15,000 square feet of turf treated per gallon of concentrate depending on the strength you use. It is also recommended that you apply the finished product with a sprayer which is able to "mist". We have many that will accomplish this goal including our 2 Quart Spritzer. It does a great job of this creating a mist which is similar to that which comes out of a can of spray paint. When mixing up product in our 2 Quart Spritzer Sprayer, (ITEM # 287747), you will only need to use 1-4 ounces per tank since it only holds a quart of finished product. Again, for thick grass like Bermuda, expect to get 500 sq/ft of turf treated per gallon of finished product; for sparse grass like bent or Fescue, coverage could reach 1000 sq/ft per gallon of finished product.